Today I'm going on FOX News Radio to talk, chat and take questions from listeners about a specific subject. I can't tell you what I'll be talking about (although I know!) but I can assure you it's a Big Topic On All Our Minds. Initially I was hesitant to do this---all progressives know to be leery of FOX, and watching Hannity's Radicalism in America (aka How To Fan the Racism and Xenophobia Flames Against Obama) show last night, followed by an exploration of the economic crisis (squarely blamed on Democrats, because we all know problems and solutions are always single partisan) didn't assuage my fears that much. If FOX has a commitment to fair and balanced reporting, you can call me a monkey's mother. I expressed these concerns to the executives at FOX and Blog Talk Radio. Apparently, I wasn't the only concerned progressive (there are four of us). We were assured that this is a legitimate, Crossfire-like debate, not an ambush or setup. And to their credit, I believe them. I think it's a great idea, and I am glad they are committed to providing a straightforward competition that furthers the discussion about key issues in our nation today. I also don't think there's a problem with partisan reporting. I do it every day at MOMocrats. Of course, I do think it's essential that you be transparent, open, and honest about where your beliefs fall. Whatever else you can say about FOX News, on FOX News Radio the talk show hosts are pretty clear about where they stand. Many of us are more in the middle, in fact, if Bell Curves are to be believed, most of us are in the middle. I count myself right there too. When I talk current events with people around me---and you can believe where I am the majority vote red---I find our concerns and values are fairly similar, the big difference is in how we think we need to pursue the doing of things, and which party we think best addresses that. I know many people haven't got the time to parse the immense amount of data and information that comes along about every current event, and many of us rely on news to triage this for us, and tell us the salient points. From news we get facts, from other media sources such as talk shows we get opinion, and an out loud parsing of the information. You all know I am a big fan of the critical thinking process. I think through constructive discussion and debate, we can think critically through information and arrive at intelligent, well-formed opinions. This is why I am a huge supporter of bi- and miltipartisan politics. So today, hopefully I contribute a little something a little positively towards this multipartisan and critical thinking process. Come listen if you have the time, and please do cast a vote for me to keep me going through the process. On Monday, October 6, MOMocrat Julie Pippert will be squaring off against fellow progressive Lynne Lupien of Left in Lowell in a unique opportunity to become America's Best Blog Talker. Help a MOMocrat out by listening in and voting for Julie! Julie was selected by FOX News Radio as one of eight of BlogTalkRadio's most passionate and incisive hosts to voice their opinions about Election 2008 in the mainstream. Beginning Monday, Oct. 6 at 2 p.m. 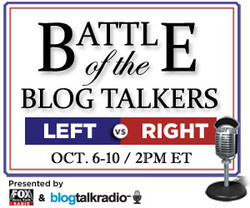 ET, four hosts from Blog Talk Radio's Heading Left Channel and four from Heading Right will square off during a week-long, one-on-one tournament that will determine the best blog talker from each side of the political spectrum. Election 2008: Battle of the Blog Talkers unfolds on FOX Across America, hosted by Spencer Hughes and carried on FOXNewsRadio.com and Sirius XM Radio. In Round 1, Spencer will moderate a debate between Julie and Lynn, who will each have five minutes of uninterrupted time to respond to the same topic. Listeners then vote (via mobile-text message and online poll) for their favorite blog talker, who in turn moves onto Round 3. Meanwhile, two Heading Right hosts square off in Round 2, with the most popular moving onto Round 4. And in Round 5, the Heading Left and Heading Right victors go head to head. It's like the "American Idol" of talk radio! You can listen in live at Fox News Radio or at Blog Talk Radio. Just be sure to listen and vote for Julie! Online and mobile voting will open at 3pm Eastern on Monday, Oct. 6th. Go to Fox News Radio for instructions on how to vote. Displaced by Ike? Worried about voting? Get your INFO and FACTS here! The Secretary of State and her staff would like to extend their sympathy to all Texans affected by Hurricane Ike. As emergency relief efforts continue, we would also like to provide basic information with regards to the upcoming November 4, 2008 election. As we learn more about the situation in all affected areas, we will provide updated information. In the meantime, the following general information may be helpful to you. We realize that evacuation is a difficult experience and that voters may not be certain of their future living arrangements, neither short nor long term. Voters who have been displaced have several options for voting in the November election. * Voter Registration and Residence. Regarding residence, our advice to people displaced by the storm is the same as to any other person—the voter is the one who decides what the voter considers to be home. If a voter relocated to another county before the storm and has decided to stay in their new county, they may register to vote in their new county. Voters in this situation must submit a new voter registration application in their new county of residence no later than October 6, 2008 in order to vote in the November election. However, if a person has been relocated due to the storm and is unsure when they can return to their home county, but intends to return, then that person can maintain their voter registration in their home county (or apply to register if not already registered). * If a voter is able to return to their home, they will likely vote as usual in their county. The counties hardest hit by the storm are still evaluating the state of their polling places, and there will likely be changes in voting locations, but it appears that all counties will be able to conduct voting during early voting and election day. Adversely impacted counties are still trying to restore power and assess damage, so it may be a few more weeks before final polling places will be ascertained. * A voter away from their county of residence may apply for a ballot by mail from their home county. Voters wishing to vote by mail must submit an application for ballot by mail to their county election office; the application must be received no later than Tuesday, October 28, 2008. On the application, the voter must indicate that they will be out of their home county during early voting and on election day. Voters need to provide a mailing address for the ballot which is outside of their home county. Our office will continue to work with local election officials to ensure that all Texas voters are able to participate in a fair, credible, and efficient election. Voters with specific questions may contact the Elections Division, toll-free at (800) 252-VOTE (8683) or visit our website for updated information.